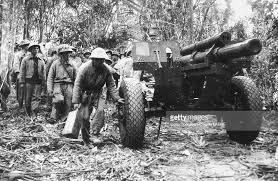 On March 13th 1954, the Viet Minh launch a powerful artillery attack upon the French garrison at Dien Bien Phu. The night the Viet Minh launch an attack on the French defensive position of Beatrice, capturing it and destroying a Foreign Legion battalion. The next night the Viet Minh attack the Gabrielle defensive position capturing it and destroying an Algerian battalion. A biography of the commander of the Viet Minh 312th Division, Colonel Le Tan. To be published on Saturday 3rd February.